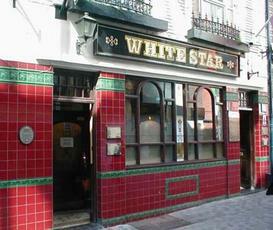 Still a reliable old boozer in the Cavern Quarter. Stopped in here for a swift half yesterday afternoon. It was fairly quiet, with only 3 others in. Although we didn't venture any further than the front bar. Caledonian Deuchars IPA & Bass appear to be the regular ales these days. Guests were Moorhouses Pride of Pendle, Purity Mad Goose & Otter Bitter. This is quite a cosy feeling pub. With a main bar area with a bit of seating and then an extra room towards the back. On the bar they had quite a few beers including- Mad Goose by Purity, Mussel Wreck by Rock the Boat, Bombardier Burning Gold and Bass (amongst others). I went for the Mussel Wreck which was quite nice and only 2.50 (on special offer though). Along the walls of the extra room there are pictures dedicated to the Beatles, sports stars and ships (including the Titanic and White Star liner). There are also plagues that indicate where the Beatles may have sat when they received their wages. There was an electric fire on which kept the place reasonably warm. They also had a few people playing Guitars and Banjos which was quite pleasant. I found the locals in here very friendly and even giving me a little bit of history about the nearby Grapes bar. Would definitely recommend a visit. Very crowded on the evening I visited which is a pity as it was not possible to view the nautical pictures on the walls. 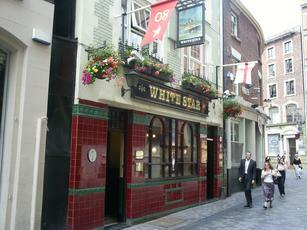 A good selection of ales and quick service despite the old soaks who refused to move from the small bar. Lovely old fashioned traditional boozer, that hasn't been spoilt by being refurbished. 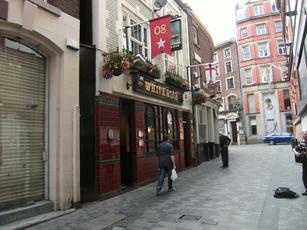 My pint of real ale was in fine fettle, however, it was the most expensive place for a drink in the city. Curved bar along with original leather seating dotted around the front of the pub, with various images and models of Titanic and other Atlantic ocean liners, add to the charm of the place.